NASA is studying possible designs for a next-generation space telescope to study dark energy as well as planets in distant star systems and other topics. WFIRST -- the Wide-Field Infrared Survey Telescope -- would have a set of infrared detectors to monitor the sky. Scientists are still studying the telescope size and other factors. WFIRST received a high rating from a 2010 review of astronomy research priorities by the National Research Council, which advises Congress and other government organizations. Even so, the cost of the mission in a time of tight budgets means the satellite is unlikely to launch until well after 2020. 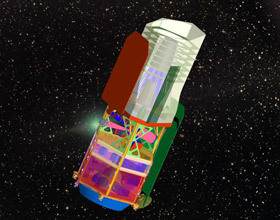 The early mission design calls for WFIRST to use three techniques to study dark energy. The first is weak gravitational lensing, in which the satellite will look for the signature of dark energy in tiny distortions in the appearances of distant galaxies. In this technique, the path of light rays from distant objects is altered a bit by the gravity of intervening objects. As the light from galaxies that are billions of light-years away speeds through the universe, its path is deflected by the gravity of galaxy clusters and vast concentrations of dark matter between those galaxies and Earth. This produces small distortions in the appearance of the distant galaxies. Astronomers use these distortions to plot the concentrations of dark matter in the universe. The distribution of dark matter depends in part on the expansion of the universe, which is affected by dark energy. Three-dimensional maps of the dark matter concentrations help astronomers plot the expansion of the universe at different epochs, which in turn helps them choose the correct explanation for dark energy. The second technique is known as baryon acoustic oscillations, and it looks at the imprint of sound waves from the early universe. These sound waves helped matter begin to clump together, forming the first structure in the universe. The ripples in the early universe established a basic "yardstick" for the distribution of matter. As the universe expands, the yardstick expands with it. By measuring the size of the yardstick at different times in the history of the universe, astronomers can plot how the rate of expansion of the universe has changed. They do so by measuring distances between galaxies and looking for a pattern in how far apart they are. Although the distances between galaxies changes over time, the pattern should remain the same at all epochs of the universe. WFIRST will look for this pattern in millions of galaxies over billions of years of cosmic time. Finally, WFIRST will measure the expansion rate of the universe by using Type 1a supernovae to measure the distances to many galaxies. These exploding stars all brighten and fade in the same way, and reach the same peak brightness. Comparing how bright a supernova appears to its true brightness reveals its distance. Once astronomers know a galaxy’s distance, they can then measure how fast it is moving away from us as a result of the expansion of the universe. Comparing many galaxies at many distances will show how the rate of expansion has changed over the eons.